From an Email received on 28 November, 2011. My name is Phillip Hodges and I live in California. I recently purchased this at an estate sale and I have no information on it. Can you help me find some historical data on it? From an email received 6 January 2012. There was a "King's Head" in Wincheap in Canterbury. From an email received 11 May 2018. I think you have a modern reproduction sign. These were very popular in Kent on the 1990’s and produced by local artists ( I think from Whitstable) for sale as curios. They are still for sale at Standard Quay in Faversham. 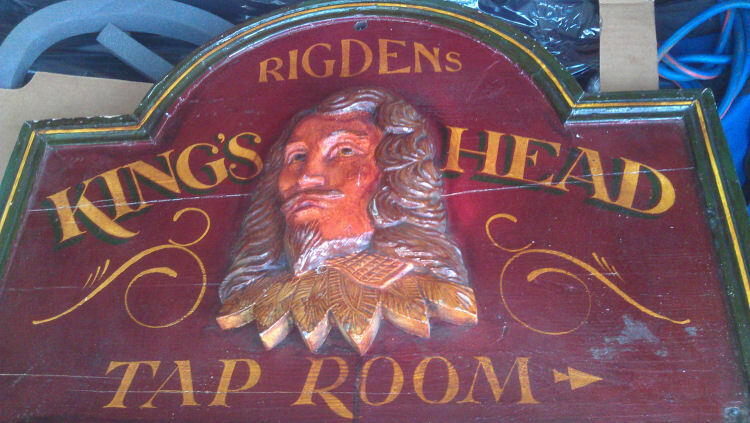 Sadly I am pretty certain this isn’t a real old pub sign at all and so the names and Rigdens Brewery, although real , have no connection with any real pub – either extant or lost! Its still a nice thing though.